Honors Program courses are small, seminar style discussions, and explore the interconnectedness of humanity. Honors courses are not necessarily harder, they are designed to enhance a student’s perspective in their chosen disciplines and in their future professional careers. 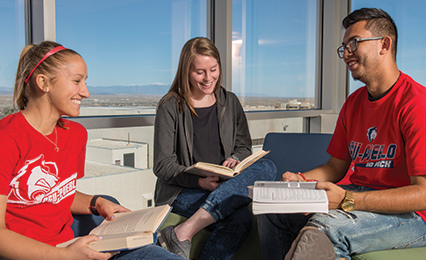 The University Honors Program at CSU-Pueblo provides high-achieving students with enhanced learning opportunities to stimulate their engagement and development, both within an intellectual community of scholars, and as citizens of the wider university community and the world. The Program provides students with special opportunities for interaction with faculty in thought-provoking seminars and intensive guided research, as well as experiential and service-learning projects. Providing opportunities for enriched work for high achieving students. Offering small classes that permit challenging study of advanced material and increased interaction with faculty who will serve as academic and pre-professional mentors. Providing students with an interdisciplinary approach to academic research through seminars and experiential learning, culminating in individual projects supervised by faculty. The Honors program dates to the 1980s led by John Ryan, an Education Professor. The program was organized around core required classes and the option existed for students to take non-honors courses for honors credit with additional work. Gayle Berardi, a Political Science professor, took over the program in 1996, when it was revamped to include freshman and senior seminars. The program had several honors courses in departments across campus. It also published student research and a guide to success at CSU-Pueblo. The program that we know now was re-introduced to the CSU-Pueblo community in the fall of 2011. It has introduced countless students to new experiences and helped them expand their knowledge. The program continues to grow including more course offerings and activities for students to engage with fellow intellectuals. 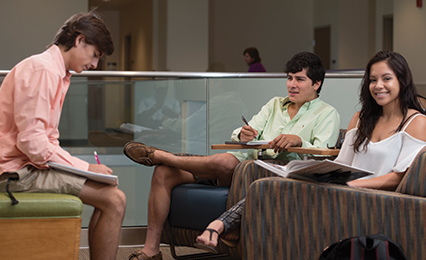 The program strives to make leaders at the university. Students not only find a place among other scholars, but lasting friendships. Fawn-Amber Montoya has been the coordinator of the Chicano Studies Program at CSU-Pueblo for the past ten years. She also served as the interim coordinator of Women’s Studies. Dr. Montoya has served on boards for a number of national, state and local entities including serving as the Co-Chair of the Chicana Caucus for the National Association for Chicano and Chicana Studies. She was appointed in 2013 to the Ludlow Massacre Centennial commission where she served as co-chair of the commission. Dr. Montoya is also the coordinator for the Smithsonian Internship Program. Dr. Montoya has an interdisciplinary focus and has received university-wide awards for service, advising, and mentoring. She has spearheaded extraordinary community projects such as the Salt Creek Memory Project. Jonathan Grunert is the 2018 Honors Faculty Fellow. His work in this role will be to develop a course for Honors students to improve research skills for their theses, and to prepare for graduate school and careers. As Assistant Professor of Library services, he oversees the Library's instruction program and functions as liaison to AIM, biology, CET, chemistry, engineering, math, physics, and the University Honors Program. Professor Grunert came to Pueblo by way of Virginia Tech, where he earned Master's Degrees in History and Science and Technology Studies. He is ABD in a Ph.D. in Science and Technology Studies; his dissertation examines the role of taxidermists in museum representations of scientific knowledge. Dr. John O'Connor was program director from 2014-2017. He returned to his position as the philosophy program coordinator in the summer of 2017. He continues to teach General Education Honors Philosophy Courses and Upper Division Honors Philosophy classes. Dr. Yvonne J. Montoya is an Assistant Professor of Communication & Rhetoric at Colorado State University-Pueblo. Additionally, she is the Program Coordinator for the Communication & Rhetoric minor and course director for COMR 103 Speaking & Listening. Dr. Montoya’s research interests include entrepreneurialism, labor, work-life wellness and organizational socialization and retention. Her Ph.D. is in Communication with an emphasis in organizational communication. She also holds a Master’s degree in Organizational Management and a Bachelor’s degree in Communication. She has taught numerous face-to-face and online courses emphasizing interpersonal, organizational, and intercultural aspects of communication. Dr. Montoya enjoys outdoor adventures with her husband, Tony, and daughter, Reyna. Dr. Joel W. Johnson is a professor of comparative and American politics. His research focuses on political institutions and political economy in developed and developing democracies. He received his PhD in political science from the University of California, San Diego. Dr. Derek Lopez is the Director of the Center for Academic Enrichment at CSU-Pueblo and teaches for the Psychology and Honors departments as well. He earned his Ph.D. from Stanford University in Educational Psychology with an emphasis in Human Development. His undergraduate degree was earned at CSU-Pueblo in Psychology. Professor Samuel Ebersole’s areas of interest include media effects, television documentary, audience research, and social media. Since 2000 he has been a NATPE Faculty Fellow, an International Radio & Television Society Fellow, a Berglund Center for Internet Studies Fellow, and a recipient of the Stephen H. Coltrin Award for Excellence in Communications Education. Professor Leticia Steffen joined the mass communications and women’s studies faculty of CSU-Pueblo in 2004 and teaches courses in journalism and media gender issues. Steffen received a bachelor’s degree from Saint Louis University, completing a double major in history and communication and graduating from the university’s honors program, and she received a master’s degree in mass communications and journalism studies from the University of Denver. Honors Program students are selected from hundreds of applicants based on the promise of academic excellence. Incoming freshmen are invited to apply if they graduated high school with a GPA of 3.8, or a minimum combined ACT score of 26, or a minimum combined SAT score of 1200. An index score determines final eligibility. Current CSU-Pueblo undergraduates and undergraduate transfer students with a minimum cumulative GPA of 3.5 may also apply to the program. Contact the Honors Program Director for more information. "Whether it's a late-night study session, a friendly game of indoor soccer, or just grabbing lunch in between classes, I find myself constantly surrounded by the many friends I have met through the honors program. Honors sections have the benefit of small class sizes where everyone knows everyone and so it creates a very interactive atmosphere. I also love that I can always find a good study partner right before a big exam." Moriah Fillmore, Valedictorian Pueblo South H.S. "The CSU-Pueblo honors program has provided me with a higher quality and more personalized education, and I have made friendships with fellow honors students that will last forever." Graham Harper, Cañon City H.S. "The Honors Program has been a great opportunity, and having the additional scholarship award allows me to focus on learning and doing my best in all of my classes." Samantha Marie Villanueva, Pueblo West H.S.